Sale Of U.S. Bombs To Israel Raises Questions The U.S. sold bunker buster bombs to Israel in 2009, a recent report details. No U.S. officials have talked openly about why the bunker busters were provided to Israel but speculation falls most heavily on the Iranian nuclear program. Penetrator bombs, commonly known as bunker busters, are stored on pallets at an ammunition plant in McAlester, Okla., in 2002. The U.S. sold 55 bunker busters to Israel in 2009, according to a recent Newsweek report. With all the recent turmoil in the Middle East, one piece of news that has been overlooked is the revelation that the Obama administration approved the sale of 55 deep-earth penetrator bombs to Israel in 2009. The transaction was recently reported by Newsweek. No U.S. officials have talked openly about why the bunker busters were provided to Israel, but speculation falls most heavily on a single target. "The one obvious use of these munitions that comes to mind would be a military strike against the Iranian nuclear program," says Paul Pillar, a former senior CIA Middle East analyst who now teaches security studies at Georgetown University. "Providing these bombs, No. 1, may make it more likely that Israel does that," Pillar says. "No. 2, even if they can come up with the technology themselves, this transfer could be interpreted as a green light from the United States for Israel to strike." Commonly referred to as bunker busters, the bombs have a specialized use: They can burrow deep into the earth or cut through a dozen feet of concrete before they explode. It's no secret that Israel has given serious thought to attacking Iran's nuclear installations. Prime Minister Benjamin Netanyahu has consistently cited Iran and its nuclear program as Israel's most important security concerns. Just last week at the U.N. General Assembly, Netanyahu referred to Iranian President Mahmoud Ahmadinejad's speech the day before as an outrageous rant. 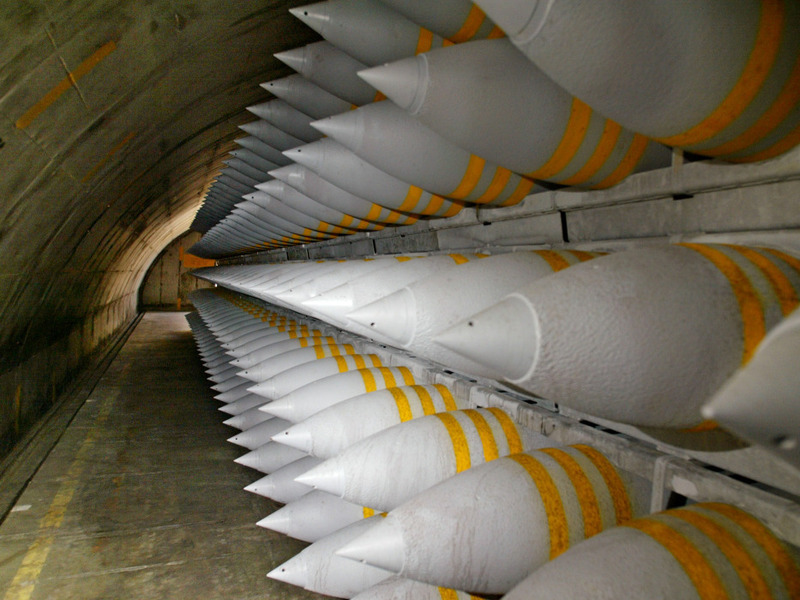 The one obvious use of these munitions that comes to mind would be a military strike against the Iranian nuclear program. "Can you imagine him armed with nuclear weapons?" Netanyahu asked. "The international community must stop Iran before it's too late. If Iran is not stopped, we will all face the specter of nuclear terrorism." But the U.S. has not given Israel the green light to mount an attack. So it was all the more surprising when it was disclosed that President Obama agreed to the sale of these bunker busters. U.S. officials have not commented on the report, but a diplomatic cable from the U.S. Embassy in Tel Aviv, written in November 2009 and found among the documents released by WikiLeaks, confirms the imminent delivery of bunker-busting bombs to Israel. The subject came up during a meeting of the U.S.-Israel Joint Political Military Group. The cable warns that the transfer should be handled quietly to avoid allegations that the U.S. government is helping Israel prepare for a strike against Iran. At that time, it was the stated policy of the Obama administration to engage in diplomacy with Iran, not threaten it with military force. Weekends on All Things Considered host Guy Raz talks with Eli Lake, the Newsweek reporter who broke the story. Seeking Influence On Other Issues? The disclosure about the bunker busters raises the question: Did the Obama administration's policy toward Iran actually include the use of force? Dalia Dassa Kaye, a fellow at UCLA's Burkle Center and a specialist on Iran, doesn't think so. She argues it was part of Israeli preparedness. "Israel clearly wants all the capabilities that are necessary to have a military option on the table," Kaye says. "They always want to show they can do it; but whether they really want to do it is an open question." Israel clearly wants all the capabilities that are necessary to have a military option on the table. They always want to show they can do it; but whether they really want to do it is an open question. There is another possible American motivation for providing these bombs to Israel. At the time, President Obama was pressuring Netanyahu to freeze the construction of new Israeli settlements on the West Bank in the interest of peace negotiations with the Palestinians. Arms deals like this one could be meant to sweeten such an effort, says Georgetown's Paul Pillar. "The provision of munitions would be one traditional way of trying to buy influence," Pillar says. "In this particular instance, it apparently did not. But I expect that that was the context in which the Obama administration was looking at it." Kaye also thinks this was a motive for President Obama's support. "There are some in the Obama administration who may have expected to get more," she says. "Not that it was a direct linkage. But they may have expected that given the extensive defense cooperation that they have been engaged [in] with the Israelis, that would buy them some political leverage. And they no doubt were disappointed." The Iranian government has made no comment on the bomb transfer.